Today's Mumbai Mirror has a front page story about the falling out between G L Raheja and his son Sandeep over the former's decision to will (or gift, the article is unclear) a portion of his wealth to his daughters. The two daughters will apparently divide 30% of their father's property between them, leaving their brother the lion's share. Sandeep Raheja, unsatisfied with the billion dollars or so he stands to control, has raised the banner of rebellion, forcing his father to retreat from the bastion of Mount Mary to a redoubt in Pali Hill. The news item recalls to me the war between Anil and Mukesh Ambani that began after their father, Dhirubhai Ambani, died without leaving a will. Less well known than the brothers' dispute is the fact that Dhirubhai had two daughters, Nina and Deepti. Under Indian law, Nina and Deepti stood to inherit an equal share of their father's wealth, except for a negligible amount of ancestral property to which only the sons and their mother had rights. But you won't see the daughters' names on any list of India's richest people. 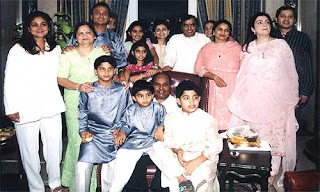 From the moment Dhirubhai died, there was never any question of his female progeny getting their hands on his riches. It was taken for granted that Anil and Mukesh would share the spoils, and the media made no issue of it. 'Why should it have been an issue?' you might ask. After all, the daughters accepted the situation voluntarily. But people also wear burqas voluntarily, and there's plenty of debate about that. It's sad that Hindu women in India tend to be effectively disinherited once they marry, despite laws protecting their claim to parental property. Another instance of good legislation that stays in the books and bears little relationship to the situation on the ground.